Last week I was at Target picking out a gift for my cousin's baby shower. 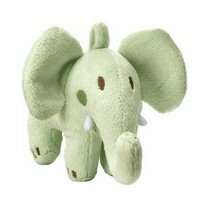 I found a really soft green elephant. I placed it in Sadie's carseat by her feet so I could continue looking at the baby toys. I reached to grab another stuffed animal so I could compare it to the elephant but in just a few seconds, Sadie had gotten a hold of it and managed to slime the poor thing. She was holding on to it's ears while making out with it's trunk. Okay, so I know babies don't make out but it is seriously the best way to describe what she looked like. It was the cutest thing I have ever seen. I took it away from her and wiped off what slober I could. I thought to myself, "Okay, so I have to buy this now. Once it dries, it should be good as new. I can still give it as a gift." Boy was I wrong. We got home and Sadie started crying. She wouldn't stop. Nothing was wrong...she just felt like crying. To get her to stop, I grabbed the infamous elephant, ripped the tags off and placed it in her chubby little hands. Silence. She had that thing soaked in a matter of minutes. Needless to say, I went back to the store the next day to buy my cousin another stuffed animal.